The year was 2030 AD. Captain Jackson Haddock was sailing in the Mediterranean Sea in his ship ‘Sirius’ with his crew of 20 men, DinDin and Professor Candyfloss Calculus. Captain Haddock had had a tired day and wanted to retire early to his cabin. He walked over to DinDin’s cabin, bid him goodnight and retired to his room in the ship. It was 2 AM when he woke up suddenly. He could not feel the ship moving. In fact, it was very definitely still. ‘Ten thousand blistering barnacles in a thundering typhoon…’ Captain Haddock roared and jumped out of his berth. There was a knock on the door. The captain opened the door and found DinDin standing there, accompanied by his dog Snowy. ‘Why has the ship stopped moving captain?’ asked DinDin gently. ‘That is what I would also like to know. That idiot of an Alan is getting more inefficient each day. Alan! Alan! Where are you?’ roared the captain. Alan was the captain’s, first mate. Alan joined them soon looking puzzled. Suddenly, to everybody’s surprise, the ship started moving again. ‘Well, Alan, why did the ship stop just now?’ demanded Captain Haddock. ‘I don’t know,’ said Alan looking puzzled. ‘Well okay, blistering barnacles! I would dearly like to know what happened just now. I only hope we wake up in one piece tomorrow morning,’ said the captain and they returned to their cabins. The next day dawned bright and sunny. The captain woke up and looked around for his bottle of Loch Lomond whiskey. He found the bottle, but it was empty. ‘That is all right. I will get another one from the storeroom,’ thought the captain. 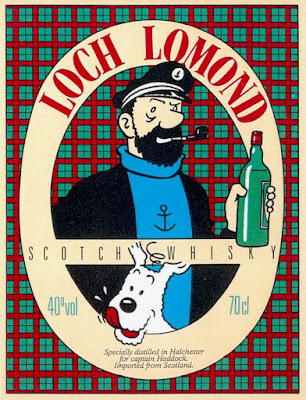 He had made sure that a hundred crates of his favorite whiskey Loch Lomond were loaded into the ship before setting sail. He headed straight for the storeroom. He passed Professor Candyfloss Calculus’ cabin on the way. The professor had been rather preoccupied the past few days. Captain Haddock had not seen much of him. The captain soon reached the storeroom, unlocked it and stood frozen in horror at the sight that met his eyes. There was not a single bottle of whiskey left. All the crates that had contained Loch Lomond were empty. ‘Billions of bilious blue blistering barnacles in a thundering typhoon! Wait till I catch the chap who is responsible for this. He is in for a rough time,’ he shouted and rushed out. ‘DinDin! Candyfloss! my whiskey! Have you seen my whiskey? Some anamorphic aardvark has stolen all my whiskey!’ roared the captain. Captain Jackson Haddock who had been listening in a daze till now suddenly stirred. The blood of his great grandfather Captain Archibald Haddock that flowed through his veins was now boiling hot… He remembered what Captain Archibald Haddock had said to Professor Cuthbert Calculus seventy years back when Cuthbert had interfered with his whiskey.